Downy mildew caused by Plasmopara viticola is a devastating disease of grapevines. Grape cultivar Shine Muscat, bred in Japan, is moderately resistant to downy mildew in Japanese vineyards and produces grapes with good flavor. 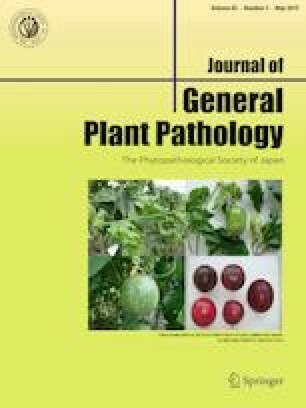 In infection assays, sporangia production on leaves inoculated with P. viticola was repressed in Shine Muscat and resistant cultivar Kober 5BB in comparison with susceptible culivar Katta Kurgan. Transcriptional analyses of these cultivars after inoculation with P. viticola revealed that the defense-related gene PR-2 was induced in Shine Muscat and Kober 5BB but not Katta Kurgan. These results demonstrate that Shine Muscat has a defense mechanism(s) that includes induction of defense-related genes such as PR-2. Analysis of the breeding line of Shine Muscat suggests that the mechanism(s) of disease resistance was transferred from Stueben to Shine Muscat.